deepin 15.9 DVD (64-Bit) | Linux DVD Shop - UK Linux Shop supplying Linux on CD, DVD and USB with Free UK Delivery, 24Hr Dispatch. deepin is an extremely polished, robust and easy-to-use distribution targeted at traditional Windows or Mac users. 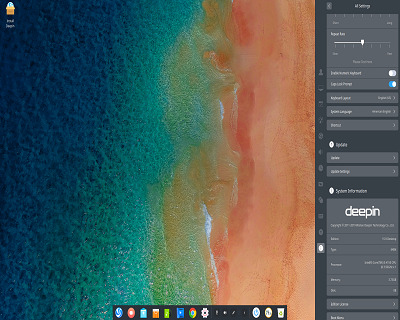 deepin has a very clean and clutter-free interface with modern looks and a breeze to install and use. deepin comes with a decent set of applications pre-installed so you can get to work immediately. It comes with Chrome, Files (nautilus), LibreOffice suite, deepin Music and Movie player, deepin USB Creator, PDF viewer, and Gparted, among many others.